There are many reasons for people to install more than one OS on their computer. Maybe you want to run Linux next to your Windows installation. Maybe you are like me and need to have an older version of Windows (let’s say XP) because your boss doesn’t want to upgrade his systems. Or maybe you need it to run the new Windows 9 beta next to your current Windows installation. What ever the reason might be, I will show you how to get it done! 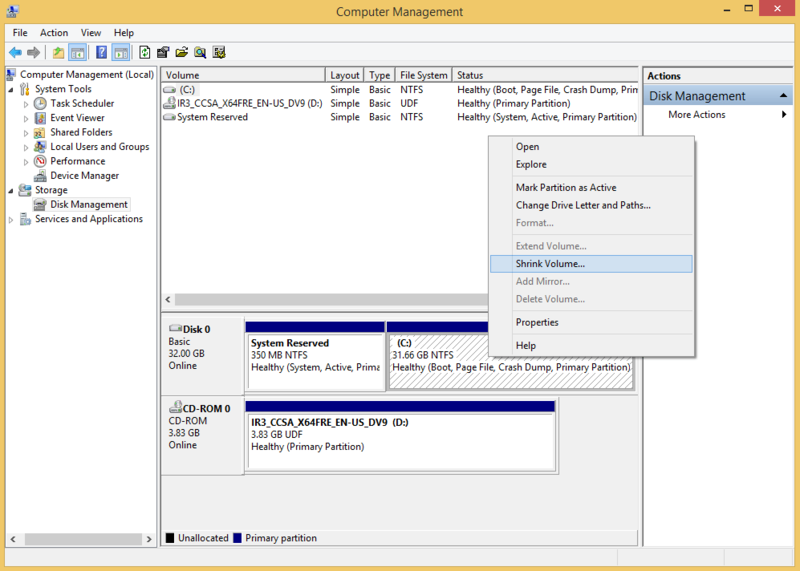 Start by removing/ ejecting all the drive you might have connected from you PC, beside the one you want to create the extra partition on. This include the USB drive you have inserted in your PC. Go to the administrative tools (start -> search -> administrative tools), select computer management -> go to disk management. Insert or connect your installation disk or USB and restart your computer. Let it boot from the installation device. When installing, be sure to select the newly created reallocated space on your drive.